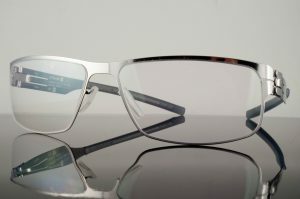 Revolutionary eyewear that is completely screwless. Their interlocking hinge system means there are no screws to fall out or break. ic! berlin glasses can be dismantled and reassembled in a matter of seconds, by hand, without extra tools. All the hinges in their collection have no screws, nails, bolts, glues, rubber bands or tiny little goblins holding everything together. They make glasses for everybody – everybody, who doesn’t want to be like everybody else. They make glasses for your face. For round, oblong, oval, square, angular, soft, large and small faces. Glasses that are exciting, quiet, bombastic, silent, edgy, classic. Zen-like cohesion or rebellious screams, but above all, functional; weightless and gentle on the skin. Marching to the beat of our own drum. Bucking the norm. Breaking the mold. No bandwagons. We are not fashion lemmings. The philosophy behind ic! berlin is a unique one: glasses should be exciting, quiet, silent – always functional, pleasant on your face and skin; harmoniously balanced, stable, and in a rhythm of its own time.